Nick Miller drinks it on New Girl. Detective Jake Peralta has been known to throw a few back on Brooklyn Nine-Nine. It was the beer that Steve and Nancy were drinking on Stranger Things before Barb disappeared. From It's Always Sunny In Philadelphia to True Detective to My Name Is Earl to Dear White People and all the TV shows and movies in between, you'll notice your favorite characters drinking beer from a bright red and gold trumpet vine labeled bottle with a blocky white "Heisler" lettering printed over it. 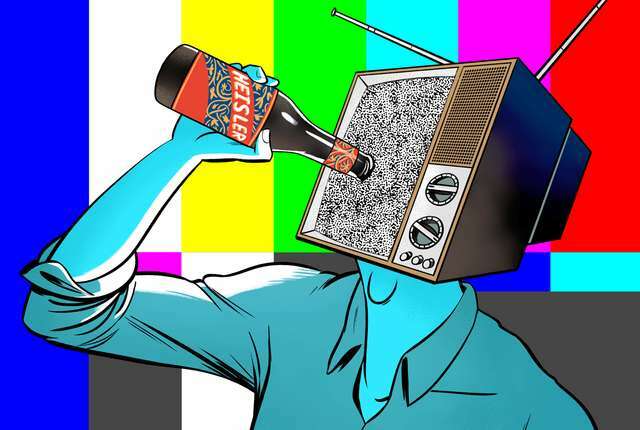 Heisler is TV's favorite fake beer, earning itself the nickname "the Bud Light of fake beers" for its on-screen ubiquity. It's one of 40 different custom fake beer labels Studio Graphics, the in-house graphics team at the legendary Hollywood prop house Independent Studio Services, has created in the past 40 years. Fake beer is the company's most popular custom design request because of how difficult it is to get product placement from beer and alcohol companies. "Most of the time their product is being used in a way that's not in the best light," Molly Rummel, the assistant manager at Studio Graphics, says. "No one's drinking a beer and going to bed. That would be boring. People are drinking a beer and beating somebody up or getting drunk." The makers of Heisler don't mind, though; you can bash their beer over someone's head for all they care. They make breakaway bottles of Heisler for that very reason. "That's the thing," Rummel says. "You can do anything with Heisler, and that's part of the joy of it." You can also put anything in a bottle of Heisler, but when Studio Graphics sells one, it's filled with non-alcoholic beer. "You can pour it in a glass, pop the cap off of it, and it's going to look just like beer on camera," Rummel says. While shooting, actors often prefer to fill their bottles or cans with soda or sparkling water since the taste of non-alcoholic beer can get old fast. For a recent shoot for It's Always Sunny In Philadelphia, Rummel says, the cast, which has spent a big chunk of its past 12 seasons drinking onscreen, "put the labels on regular cans of water so they could do take after take after take without getting sick." It's safe to say that Hollywood isn't sick of Heisler yet, and that might have something to do with its design. Often, fake brands are just creative versions of more recognizable ones that the production didn't have permission to use, like another Studio Graphics creation Let's potato chips, which is their de facto version of Lay's that you might have seen Leonard review on Community. Heisler isn't a play on another beer label; it's something all its own. "[Heisler] doesn't completely copy something, but it still feels real, which is the reason that it's used across the board," Rummel says. "Whether it's a dramatic piece or a half-hour sitcom, it sort of fits in. You can use it in a bar in Texas or one in New York." She chalks that versatility up to the beer's timeless look. "I think it's definitely something that's simplistic," she says of the Heisler label. "I think that trends of design come and go, just like fashion, and one of the things that continues is simplicity." Since Heisler's creation in the in the mid-to-late '90s, Studio Graphics has created a few different iterations of the brand -- the original Heisler gold ale, Heisler Lite, and the vintage Heisler for shows set in the '40s through '80s. But there hasn't been any huge changes to the original red label. All of this makes it easy to spot once you know what you're looking for. "That's what stands out as great design," Rummel says. "Something that can fit and doesn't stand out and isn't out of place, which is difficult when you're making stuff that's fake." Studio Graphics' other fake beers like El Brazo, Cerveza Clara, and Rummel's personal favorite American Colonial, which is a "very microbrewery Northeastern beer but also can be read as Budweiser-y," can be seen all over TV in shows like Parks and Recreation, Shameless, and The Walking Dead. But it's Heisler that's their most consistent top seller. "We sell at least one bottle of Heisler a day," says Rummel, which leads to hundreds or even thousands being sold each year. Over the course of seven seasons, New Girl bought over 40 cases, which is nearly a thousand bottles, all on its own. The details of how the Heisler brand was born, though, are a little harder to pin down. Rummel says that each of the company's designs are a collaborative effort of multiple designers, which is why after 20 years, Heisler's origin story is a bit of a mystery. "I've talked to some of our old-timers, and no one can remember just who created it," says Rummel, who's worked at Studio Graphics for the past three years after previously working as a prop master. It's also hard to pinpoint the first time Heisler appeared on TV. "It could have been created for one project or multiple," she says, noting they work on upwards of a hundred projects at once, making it easy to lose track of specifics. The old-timers also can't remember where the name Heisler came from, though, Rummel assumes it's "somebody's name somewhere," making it possibly one of the longest running inside jokes on TV. Studio Graphics is the one laughing all the way to the bank, though, since they now own the Heisler name. "We were the first people, according to our lawyer, that put a patent on a fake brand," Rummel says, which was difficult to explain legally. "It's like, ‘It's not real, but we're still trying to patent it like it is.' It's one of those things where other people don't do it, so it's really exciting to be on the forefront of that." Studio Graphics plans to copyright other fake brands in the future, but they started with Heisler because it's become so synonymous with what they do. Heisler has become a pop culture staple that directors often ask for by name and fans want to give as gifts. Every December, Rummel gets holiday requests for bottles of Heisler. Two years ago, she sent a six-pack to New Zealand. "It's sort of taken on a life of it is own," she says. It's something Studio Graphics doesn't take for granted, since it's so rare, though it seems to have more than one hit on its hands. Along with Heisler, Studio Graphics also created Morley cigarettes, the brand of choice for the Cigarette Smoking Man on The X-Files and most recently seen on Twin Peaks: The Return. These are the brands that take on a life of their own, even inspiring fan theories about how shows like New Girl and True Detective are actually connected based on their beer choices. The way these fake products allow people to really get lost in these imaginary worlds "is sort of the point of movies and television," Rummel says. "For us to be able to help with that is really cool."